Actually, a good jumper starter is not only a power sources, but also is power transfer. 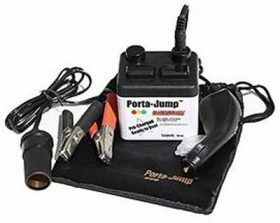 We are here introducing five best 20 to 109 Volts Jump Starters – power transfers for your picking up. These five product 20 to 109 volts jump starters can be used as power transfer and power sources. More important, they are portable ! This unit is the “Big Boy” of wheeled jump starting units and is specifically designed for the over-the-road transportation industry. You will find the unit delivers the instant raw power of 1400 cold cranking Amps in 12 Volt mode and 800 cold cranking Amps in 24 Volt mode. What’s more, its quick-connect lugs provide easy, verifiable change of operating voltage. 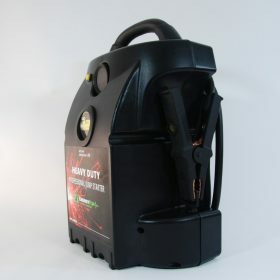 The Porta-JumpTM Pre-Charged Emergency Car Jumpstarter does not require periodic recharging to maintain its 30 volts of power. If you never need to use your Porta- Jump, it will retain its full charge for up to 5 years. What’s more, the porta-jump charges your battery right through your car’s cigarette lighter socket, so you never have to leave your vehicle. 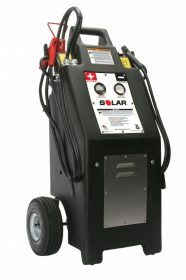 The model features Dual ES Series Batteries that deliver 1500 Peak Amps of 24 Volt power. Its batteries were developed specifically for vehicle starting applications and it can deliver high output current, extended cranking power, numerous jumps per charge and a long service life. What’s more, the jump starter also features extra-long cables for ideal positioning during jump starting and industrial grade Hot Jaw clamps for maximum power transfer to the vehicle. The PRO 24V – Heavy Duty Jump Starter is designed for the professional in mind and all featuring digital display is designed for battery state of charge. the heavy duty copper clamps come with an LED light, and pure copper 1/0 AWG cables. What’s more, with a 24V-2Ah fully automatic battery, you never need to worry about over charging your booster. 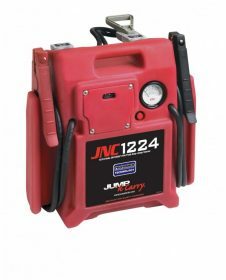 The JNC1224 features the extreme power that Jump-N-Carry is known for, delivering 3400 Peak Amps in 12 Volt mode and 1700 Peak Amps in 24 Volt mode. 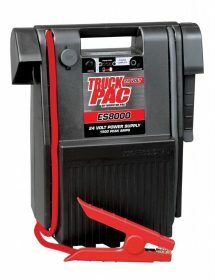 In addition, the jump starter is great for penetrating corroded battery terminals to achieve an optimal power transfer. Its heavy-duty case is designed to withstand the rigors of everyday professional use and is amazingly impact resistant.